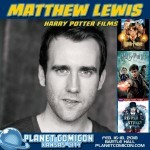 Matthew Lewis, best known to Potter fans as the actor who played Neville Longbottom in the films, is set to join a full schedule of special guests from all walks of popular culture at Planet Comicon Kansas City. There’s no doubt that Lewis’s role as Neville, the clumsy little Gryffindor who grew into a valiant yet unexpected hero, was one of the most iconic characters in the series. Fans still adore the uncertain budding Hogwarts student who stood up to his friends in Harry Potter and the Sorcerer’s Stone as much as they cheer for the young man we are reacquainted with in Deathly Hallows, who arguably becomes the catalyst in the quest to defeat the Dark Lord. Though Lewis’s schedule for the weekend has yet to be posted, he will undoubtedly delight Potter fans in attendance at the midwest Con with some magical stories from his days on set at the Warner Bros Studio Leavesden with fellow cast members Daniel Radcliffe, Emma Watson, Rupert Grint and company. If they’re lucky he may even share a few rarely-heard insights about his beloved character Neville. Just a few of the many other personalities scheduled to appear at the Kansas City event include Justice League and Game of Thrones star Jason Momoa, Alex Kingston, Doctor’s wife River Song in Doctor Who, Michael Rooker of Guardians of the Galaxy, and Cooper Andrews of AMC’s The Walking Dead and Halt and Catch Fire. Most recently added to the lineup is Danny Trejo of SpyKids, and Breaking Bad fame. The convention, which is in its 19th year, is scheduled for February 16-18 at Bartle Hall in downtown Kansas City, Missouri. Officials with the event have indicated that there may be an additional 20 media guests announced prior to the big weekend. 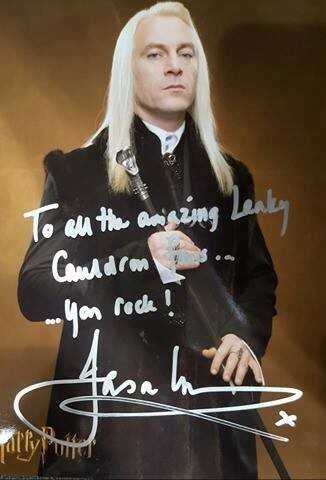 Could there be another actor from the Potterverse included in that group? We’ll definitely keep you posted. 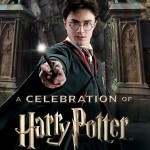 Will you be headed to Kansas City next February to see Matthew Lewis? If so, get your Potter cosplay ready and let us know how it goes. Maybe you’ll even meet Neville! More information and tickets for Planet Comicon Kansas City can be found here.